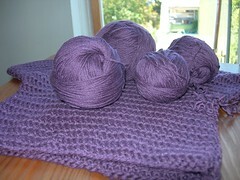 Recently, I haven’t been blogging much about my knitting & crochet proejcts. (Seems the last thing I mentioned was an update on my Icelandic Turtleneck.) So, I thought I’d do a quickie update on everything. I’ve been working on the Icelandic Turtleneck from the Crochet Me book for a few weeks. I got a lot done right before and after the trip out to Colorado for Bill & Andrea’s wedding, but then let it sit for a while. Yesterday I picked it back up and got through the part where you create the armholes. I tried it on and it was too big, even though I’m making the smallest size and am under guage. Now, I can’t say I’m surprised to hear this because other folks have found that the pattern runs big as well – partly because of the stretchiness of the stitch, no doubt. I considered making smaller arm holes and throwing in some decreases at the same time, but decided that given the stretchiness of the fabric, it probably made more sense to rip back to the last spot where I increased for the shoulders and bust. 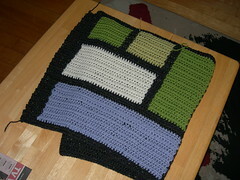 So, I just ripped back 12 rows, and I’m going to give this another shot with half of the increases. If that doesn’t work, I think I might frog the whole thing and try again with an even smaller hook. We’ll see how it goes! KnitMap! Find a local yarn store and filter in a variety of useful ways: exclude chain stores, find yarn stores with wifi and/or spinning supplies, etc. And to boot, it’s a Google Maps mashup. Nice. This afternoon, Joelle and I went to Spark Crafts in Porter Square for a pre-launch book signing and trunk show for the Crochet Me (new website!) book. It was a small group (I didn’t hear about it until Wednesday) but Kim was awesome, and we got to handle a bunch of projects from Interweave Crochet, and from the book itself. It was really fun to finally get to meet her, and the book is just as fantastic as I knew it would be! We also got to chat with Jess & Casey of Ravelry fame. I haven’t been crocheting much lately, but there are a ton of great projects in this book, including a super cute shell done in the round. I think I might have to make that once I work through a little bit more of the stash (or get a real job, whichever comes first). There’s also a really great felted messenger bag, which I think I may have to make as well (and which could incorporate a fair amount of various stashed wools, now that I think about it). Anyway, fun times, great patterns, and I managed not to buy any yarn while we were at Spark (um, because I didn’t look at it). Still waiting to get into Ravelry? Just in case you’re still waiting to get into Ravelry, I thought I’d pass along a tidbit from Casey & Jess: They’ve added a feature where you can check your position on the Ravelry waiting list. Casey’s also noted that they hope to be able to open the whole thing up to everyone in a few weeks.